Tradition is a word synonymous with La Capannina Restaurant, it's the finest quality produce, the cuisine skills of head chef Mauro and his team Sergio, Carlos and Costa in the kitchen producing classic Italian and French dishes, the impeccable silver service of owner Tino Rossi and maitre d's brothers Fernando and Joel, the attentive drinks service of Mara, the warm ambience and the sense of that special moment, lunch or dinner, whatever the occasion. La Capannina is a haven where it's possible to relax, unwind and recharge for a blissful moment in time. And diners are assured of the staff's highest confidence, discretion and friendliness. 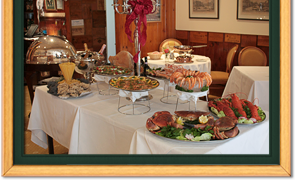 We invite you to explore our menus and wine list to whet your appetite, but to gain a true feel of La Capannina we recommend you reserve a table and experience the tradition. Reserve our conservatory and make your celebration a more private affair. The most tender and exquisite cut of lamb. Thinly cut raw beef in olive oil. Homemade black spaghetti in salmon sauce. Locally sourced on a daily basis. Each day we offer twenty varieties of vegetable. As well as offering a wide range of vegetables, La Capannina also prides itself on the variety of potato it serves.